Hey guys. This may be obvious since I haven't posted in quite a long while, but I've decided not to continue writing my blog. It had started to feel a bit too much like work, which I have enough of already. I may start things up again if I regain my inspiration. I will, of course, leave up all my posts for you to carry on viewing. Mother's day, in the UK at least, is in two days time. I hope anybody who has a loving mother has gotten her a present already, but if you haven't (or need ideas for next year) and want some ideas outside of the standard flowers and "world's best mum" mugs, then I hope this guide can help you! If your mum likes being pampered and your local salon (or whoever does beauty treatments near you) does vouchers, then this could be a nice idea for her. If you're stuck on what treatment to get her then you could go for a pedicure or manicure. If your mother has a favourite band or artist who is family friendly then it could be a nice day out - if you have siblings you can split the costs between you. This wasn't for mother's day, but as a present for my mum's birthday we went to see the band Take That, one of my mum's favourite (and most fancied) bands! There are tons of tutorials out there which teach you how to make different kinds of origami boxes, which you could then decorate and fill with a few little treats such as mini bottles of perfume, mini bottles of nail polish in her favourite colour, chocolates, or other nice little things. Does your mum have a signature item that she can't get enough of? Handbags? Shoes? For my mum it's scarves - a pretty new scarf is always a safe bet for a present for her. While novelty presents are fun, the enjoyment gained from them in the long term is a lot less compared to something she'll actually use. If your mother loves baking then get her some sort of kitchen equipment she doesn't already have, if she loves wearing jewelry then get her a pretty new jewelry box, something along those lines. This post is to get the ball rolling. Make it personal to your mum, of course, and give it to her with a card and, most importantly, a big hug! This post will serve as a list of all fairly affordable clothing and accessory shops I've found both online and on the high street. If you have any suggestions for shops to be added then post them in the comments below and I'll consider them. I'll update this post each time I find more shops, and I'll try and update the list to make it more readable too, so this is an ongoing work in progress. Hope you find this useful! Sunday night was the night of The Oscars 2013! We found out who won the awards, but which ladies were the style winners? Here are my top picks from the red carpet. Black is classic, and these ladies were just that. My favourite: Adele, who looked every inch the bond girl in her Jenny Packham gown. Light pinks and purples, as well as whites, were very popular on the red carpet this year. My favourite: Charlize Theron. A look that was simple but absolutely stunning. Looking forward to seeing a whole lot more white this spring! There were slim pickings for bright coloured gowns this year, but most of the ladies who did wear them got it right. My favourite: Jennifer Aniston, who looked as vibrant as her dress. What a beautiful lady! These starlets barely needed their metallic gowns to sparkle. My favourite: Jessica Chastain. She rocked the old hollywood glamour look with this dress, hair and makeup. She may not have won Best Actress but she certainly was a winner style-wise in my books! This post was created as part of IFB Project #84. So, those are my picks, but who wore your favourite looks that evening? Comments always appreciated. Hi there. Spring most definitely has not sprung quite yet, but I'm sure we all want to be prepared for when it does. So here are some beauty trends that I'll be looking forward to for this spring! Drop that lip gloss - the lip texture for this spring is matte. Think velvety and smooth rather than dry. I particularly love the bright coral shade used by Missoni (on the right). Pink is the colour of this spring beauty-wise, whether it's a pale shade or a vibrant one. The bright pink mascara might be a little much, so instead wear a bright pop of fuchsia on your lips, go for a pink eyeshadow that suits your eye colour, or go a little crazy with the pink blush. Not exactly ground-breaking stuff, but this is a look that's refreshing to see after all the oxblood-stained lips of autumn and winter. It's all about pretty, glowing skin, bronzer and blusher, and possibly (gasp) bare lashes! Whether its the sixties-inspired look from Marc Jacobs or the bold, bright coloured liner from Michael Kors, this spring is the time to experiment with your liner. Try looking up makeup tutorials for ideas on what you can do with your eyeliner - there's tons of them! Go easy on the plucking, and have your eyebrow pencil handy. Bold eyebrows have been in for quite some time now, which is good news if you're like me and have naturally fairly thick brows. As seen on model of the moment Cara Delevingne (she's on the right in the stand-out liner picture). 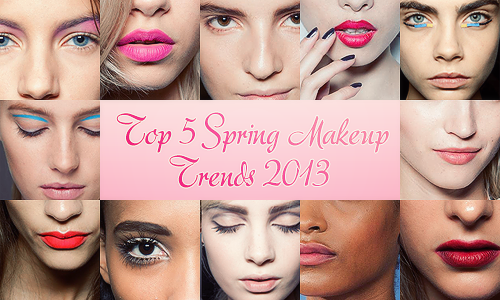 So what are you looking forward to this spring beauty-wise? Feel free to leave your comments below. My name is Katy. I'm a pint-sized, cheesecake-loving British girl with a love for bargain hunting. Welcome to my messy little style blog!